Pencil and watercolor drawing of hit of Sarah Obadiah, near New Bedford, MA. Supposedly done with aid of camera obscura. 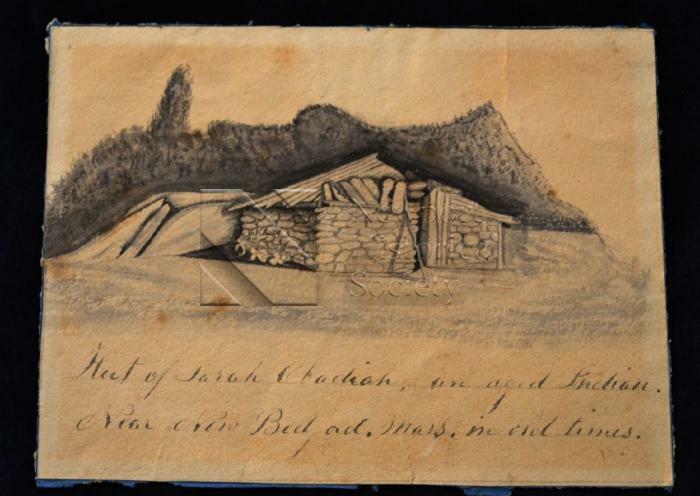 Front of the drawing reads, "Hut of Sarah Obadiah, an aged Indian. Near New Bedford, Mass in old times." Verso reads "This picture is a relic of my Mother's early days. She with some of her friends one day while she was visiting at Wm Rotch's, New Bedford, took a walk out to see the old Indian - one young man of the company carried his Camera-Obsura and this view of the Hut and its back ground was taken. I have no means of knowing the date; it was before she was married, and that was the summer of 1807. C.W."